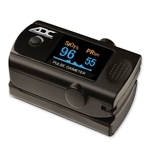 The BCI« 3180 Pulse Oximeter provides exceptional value for everyday oximetry needs. This compact, stand-alone monitor delivers fast, reliable SpO2 pulse rate and pulse strength measurements complete with plethysmographic waveform, and up to 30 hours of on-screen trending. Plus, the bright liquid crystal display, easy-to-use menu, and audible and visible alarms enhance clinical efficiency and quality of care of patients ranging from neonate to adult. Audio Status: Yellow LED and displayed symbol indicates alarm audio paused (2 min. Tired of searching for the medical supplies or equipment you require only to find them overpriced or out of stock? Need a great source for Bedside Pulse Oximeter With Waveform LCD with low prices and fast shipping? Medical Device Depot is the premier source that will be the most responsive to your needs and the most beneficial to your company. Our professional service agents can also answer any questions and address any concerns you may have so you can order exactly what you need, hassle-free. You can always visit the 'My Account / Order Status' link at the top right hand side of our site to view orders you have placed, change or cancel an unprocessed order, track your shipping and more.We accept all major credit cards and can also accommodate purchase orders from large institutions. Purchase orders may be faxed to 410-505-4567. Looking to lease instead of buy? Most of our products offer a lease application right on the product page - you can conserve your working capital and get tax deductions for all your medical device needs. Our site offers the highest level of security and encryption, backed by Volusion Secure Site SSL and Norton Secured by Verisign, so you can shop worry-free.